The 18-hole round is in excellent conditions. 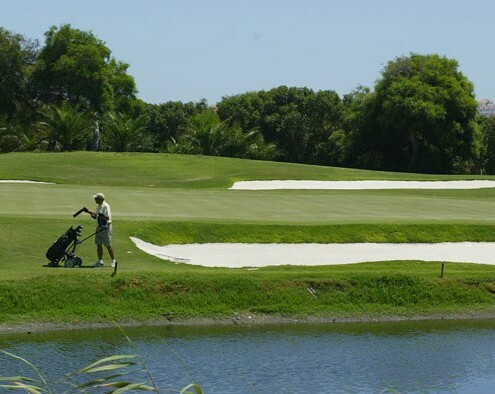 It is characterized by wide fairways, 9 lakes and the greens well protected by bunkers care about design. Billed as the flattest area of ​​Spain its route is very comfortable and the main difficulty is the long holes and the design of the greens. The field has sufficient level for the organization of competitions including having performed several tests of the national circuit. A variety of genuinely Mediterranean vegetation prevails throughout the country. The perimeter consists of transparent, tamarisks and mimosas. In the rough and gardens are Aleppo pines, eucalyptus, palms, olive trees, oleanders, plumeras, bougainvillea, palm pistósforos. Grass varieties are the Greens in penncross (agrostis stolonifera) and Tees, Fairways and Anteegreens TIFFWAY BERMUDA 419.